There’s been a lot of hype surrounding social commerce — the idea that posts and ads on sites like Facebook and Pinterest would generate lots of immediate sales on e-commerce sites. Today only a fraction of retailer’s online sales are actually generated directly through a referral from a social network. 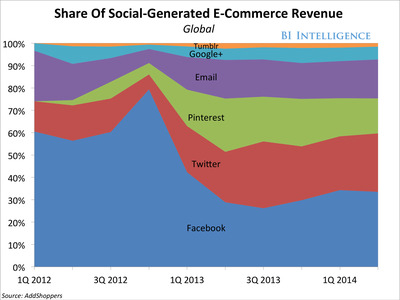 But the volume of social commerce is growing quickly, in the triple digits in many cases. Overall, social commerce sales grew at three times the rate of overall e-commerce last year. In a new report from BI Intelligence we break down how social media is impacting retail sales throughout the purchase process — whether a social media user clicks directly from a retailer’s Facebook ad to make a purchase, or sees a pin on Pinterest and ends up buying the product in-store a week later. We look at the varied metrics that underscore social commerce performance at the different networks, including conversion rates, average order value, and revenue generated by shares, likes, and tweets. We also outline the latest commerce efforts by leading social networks. Social commerce is growing quickly: The top 500 retailers earned $US2.69 billion from social shopping in 2013, according to the Internet Retailer’s Social Media 500, up more than 60% over 2012, while the e-commerce market as a whole grew only 17%. Social commerce is even larger in terms of revenue generation when looking not at traditional direct referrals, when the last click before purchase happens on a social-media site, but when looking at where consumers began their purchase process, i.e., the first click. Growth is sure to accelerate and conversion rates should improve as Twitter and Facebook roll out “Buy” buttons, which will allow social-network audiences to initiate an e-commerce purchase by clicking on a retailer’s post or tweet. Facebook’s tests began in July, Twitter’s in September. Facebook is the clear leader for social-commerce referrals and sales: This is due in large part to the sheer size of its audience — 71% of US adult internet users are on Facebook. A Facebook share of an e-commerce post translates to an average $US3.58 in revenue from sales, according to AddShoppers. On Twitter, a share or retweet is worth only 85 cents. But other sites are gaining, and even leading on, specific metrics, like average order value (AOV): Polyvore, for example, sees $US66.75 in AOV from social referrals, according to Shopify. Pinterest sees $US65. That’s compared to Facebook, which sees $US55 AOV. Pinterest also drives more social sharing of retail content than any other network including Facebook. For full access to all our reports, downloadable charts, and daily briefs on the digital media industry, sign up for a free trial.